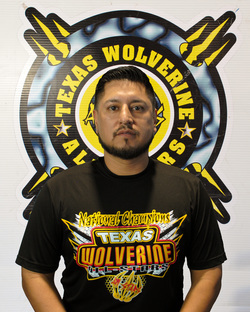 Luis is the Owner of Texas Wolverine All-Stars as well as a head coach for 18 seasons. Coach Luis has over 25 years of cheer-leading and tumbling experience and also specializes in elite power, and specialty tumbling passes. Luis has received over 150+ National titles with TWA Level 1 through Level 5. He has choreographed countless routines starting from elementary level to collegiate level athletes. Luis was part of C.O.A. staff for 2 years and also cheered/choreographed with the San Antonio Spurs Coyote Crew. Dez a long time athlete and coach of TWA has been with the gym since the opening in 1998 and cheering altogether since she was 7 years old. Being a long time member of McCollum High School Cheer-leading team and ending being Captain her senior year. After High School Dez tried out for a spot on the University of Houston cheer-leading team and made it. Dez has also been apart of NCA and COA staff, doing High School and All-Star camps and competitions. Her awards consist of All-American for over 12 years and Top All-Star 7 years in a row. ​Coach Dez's favorite part of cheer-leading is Stunts and Dance. Lex has been cheering for 17 years and has been with TWA since the opening in 1998. Lex has been coaching for 5 years and is a graduate of Orion High School and is best known for his elite and power tumbling skills while instructing private and full class tumbling lessons from beginning levels to advance. Lex's favorite part of cheer-leading is tumbling and is also TWA's head tumbling instructor. Janice a long time athlete of TWA, she began at the age of 8. joining the STAFF here at TWA in 2010. Graduating from Lanier High School in 2011 Cheering as a varsity cheerleader 2009-10 & 2010-11 and followed a career in cosmetology and graduating from Ogle School of Hair, Skin and Nails. ​Coach Janice's favorite part of cheer is Jumps and Dance. Coach Janice is also one of our TWAFIT4U Fitness Instructors. Susie another long time athlete of TWA since 2002. She began cheer-leading in middle school and continuing at Southwest High School. Susie began as an athlete with our program in 2006 and has now become apart of our amazing staff. Susie's favorite part of all-star cheer-leading is dance and advance stunting. Britney started cheering in 2009 followed by joining her High School Varsity Team at East Central High School. Shortly after she joined one of our elite All-star Teams here at TWA and continues to thrive as one of our advanced flyers. Britney's favorite part of All-star cheer-leading is advanced stunting, so that she can grasp new and advancing skills in today's All-star cheer world. Charles began as an athlete with TWA in 2011 and began coaching in 2016. Being a long time athlete at Harlandale High School and San Antonio College, Charles bring skills from stunting and has also had his children in our all-star program as well. Charles favorite part of all-star cheer-leading is tumbling and advanced stunting. Melo has been cheering for 14 years and has been with the TWA family for over 14 years and has been coaching for past 4 years. Melo's favorite part of cheer-leading is the ending dance.